Microsoft Virtualization: Master Microsoft Server, Desktop, Application, and Presentation Virtualization serves a thorough reference for those considering a migration into the virtualized world. It provides the tools and explanations needed to create a fresh virtualization environment. Readers walk through step-by-step instructions on everything from building a Windows 2008 server to installing and configuring Hyper-V and App-V. The book begins with the basics of virtualization, including the role of virtualization in the changing landscape of the traditional data center and its benefits, and the strategies of virtualization. It presents the step-by-step process used to build a Windows 2008 server and the process of configuring and managing a Hyper-V infrastructure. Microsoft's approach to high availability and the combination of Microsoft tools to provide a very reliable and highly available virtualization infrastructure are discussed. The chapters also cover the migration of physical servers to virtual servers; the Dynamic Data Center concept; creating and publishing a virtual application within App-V; and desktop virtualization. This book was intended for seasoned system administrators and engineers who grew up in and still manage primarily a hardware-based server environment containing a large assortment of both newer and legacy applications. 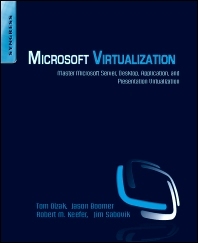 Chapter 1 What is virtualization? What is a virtual machine template? What is an App-V package? IT professional with over 25 years experience in programming, network engineering, and security. I have an MBA as well as CISSP and MCSE certifications. Currently I'm Director of Information Security at HCR Manor Care. I’m responsible for managing the corporate security program, change management, and business continuity planning. I am also the CEO of a security training company. Prior to my current job, I held positions as an IS Director, Director of Infrastructure Engineering, and Programming Manager at a variety of manufacturing and distribution companies. Before joining the private sector, I served ten years in the United States Army Military Police with four years as a Military Police Investigator. I've written a book, Just Enough Security, and various papers on security management.